On Monday, the governments of India and Sri Lanka concluded an agreement to increase bilateral cooperation along a range of security issues, focusing primarily on drug and human trafficking. Sanjay Mitra, the Indian defense secretary, visited the Sri Lankan capital Colombo on Monday where he met with President Maithripala Sirisena. The two sides “agreed to increase cooperation in security and defense spheres in several areas, including regional security, curbing drug smuggling and human trafficking, and training of members of the security forces,” a statement released by the Sri Lankan president’s media division noted. Sirisena “thanked the Indian government for the cooperation extended to Sri Lanka in security issues and for training provided to Sri Lankan security forces personnel,” the statement added. The two sides are expected to continue discussions on these issues at the working level. “President Sirisena stressed the importance of close cooperation between the two countries to ensure regional security,” the Sri Lankan side noted. 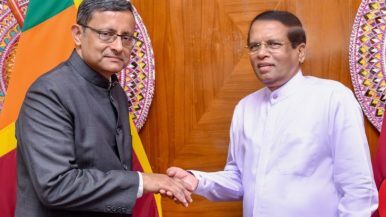 Mitra and Sirisena discussed the broader India-Sri Lanka security and strategic partnership as well, though neither side provided specific details on what else was discussed. Relations between India and Sri Lanka improved in 2015 after Sirisena was elected, ousting former President Mahinda Rajapaksa, who was seen by New Delhi as favoring China. However, last year, amid a constitutional crisis in Colombo, relations deteriorated. Sirisena, in October 2018, publicly claimed that he believed India was trying to assassinate him — a statement that the Indian government strongly rejected. Colombo and New Delhi have long history of security cooperation. In recent years, the two sides have steadily increased their military-to-military relationship. Sri Lanka’s strategic location just south of India astride critical sea lanes of communication has increased New Delhi’s interest in recent years, particularly as Beijing makes headway into the region. To that end, Colombo has pursued a major infrastructure buildup across several ports, including Colombo, Hambantota, and Trincomalee.